Although leaks can happen even to relatively new gutters, it’s far more common for sectional gutters to leak as they age. This is because the sections are either sealed to one another or screwed to one another. Over time, sealant deteriorates and screws fall out or come loose. Because water will always follow the path of least resistance, if there is a hole, you’ll end up with a leak. The good news is that you can use a silicone waterproof sealant to close up those leaks and prolong the life of your gutters, in many cases. Gutters require a gentle slope to function effectively. Water runs down the slope to the downspout. If the slope isn’t set up right originally or the gutters have sagged over time, either due to aging of the home or being too full of debris, water pools in the gutter. Over time, gutters begin to corrode and rust and you’ll end up with a leak. Your gutter installer can check the slope of your gutters and adjust as necessary. If your gutters are pulling away or falling off your home, it may appear you have a leak. Often, the real issue is that the gutters aren’t fastened tightly to the fascia. 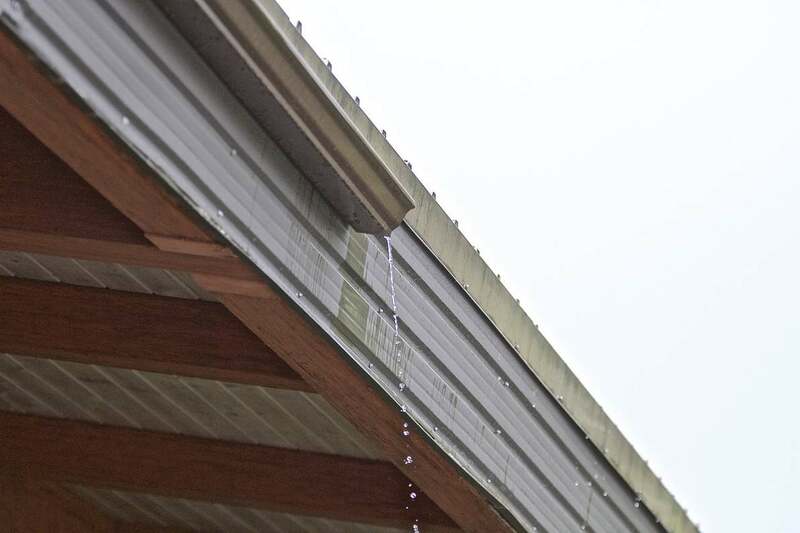 Water can’t run off the roof and into the gutter, so it runs between the gutter and the roof’s edge. The solution for loose gutters is to re-attach them or find a stronger fastener. Keep in mind even the strongest fastener won’t hold to a rotting fascia board. No matter how your gutters are attached to your home, you need to check the security of the fasteners annually as part of home maintenance. Only the best gutter guards for steep roofs will ensure you don’t ever deal with clogged gutters. If your gutters are overflowing, chances are good you have clogged gutters. Although clogged gutters aren’t always leaking gutters, they are a big reason gutters end up with leaks. A gutter was not meant to handle the weight of wet debris and standing water. The excess weight can cause seams to fail, and gutters to sag and pull away from the home – all of which lead to what appears to be a leaking gutter. Roof gutter guard systems aren’t the only solution to gutter leaks, but they can help tremendously. If you’re looking for the best gutter guards for steep roofs, call Gutter Helmet at (800) 824-3772. We’ll connect you with your local Gutter Helmet authorized installer. If you’d like to be contacted directly for a free quote, fill out our contact form today.